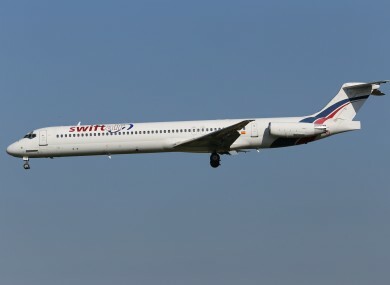 Photo of the Swiftair charter aircraft. MISSING ALGERIE AIR flight AH 5107 carrying 116 people crashed according to an Algerian official quoted by Reuters. The journey is usually directly north with reports that the pilot had changed course to avoid storms in the area. The four hour passenger route is flown four times a week. French authorities confirmed that French nationals were on board the plane which dropped off the radar as it flew over northern Mali. Ouagadougou Airport has confirmed that there were 51 French passengers on board, 28 from Burkina Faso, 20 Lebanese, five Canadians, four Germans, one from Luxembourg, one from Switzerland and six Spanish crew. At least 22 of the passengers were due to fly into France from Algiers, according to airport sources and border police. Fifteen were due to fly to Paris and seven to Marseille. France has sent two Mirage 2000 jets to look for the plane that went missing less than an hour after takeoff from Ouagadougou. Contact with the flight was lost over northern Mali at about 1.55 am (GMT) this morning. The Air Algerie flight was a charted from Spanish operator Swiftair with Spanish aviation officials confirming that six Spanish crew were on board. Email “Air Algerie flight carrying 116 people crashed - Reports”. Feedback on “Air Algerie flight carrying 116 people crashed - Reports”.